Moving doesn’t have to be horribly expensive. Yes, you read that right. Just because you’re pulling up stakes, that doesn’t mean you have to empty out your entire savings account. Take a look through our five favorite ways to save on every move and see where your budget can get a little reprieve. We’ve already dedicated an entire post to regaling you with all the reasons moving in the winter is the best, but just in case you need a refresher: From house prices to moving services, just about every aspect of moving is cheaper in the offseason. Even gas prices are lower in the colder months. This holds true even in spots that don’t get especially cold or unpleasant during the winter, such as the South. Why? No one really knows. Liquor stores hold the key to small, free, durable boxes. They’re a great option for your books and other heavy items. Go to your nearest location and ask where and when they get rid of their boxes. For larger boxes, you might have to pay. U-Haul is one of the best options for cheap boxes. Not only do they run you only a buck or two apiece, but you can purchase them in groups or individually and the company will buy back any boxes you don’t use. If you’re using a packing, moving, or driving service, do your due diligence. Go ahead and call up the company so you can talk through your options with a real person. This will give you the chance to ask, “Can you do any better?” or “Do you have a more affordable options?” You would be amazed what you can get simply by being kind to customer service representatives and asking for a discount. There’s never a better time to comb through your possessions than when you’re getting ready to relocate. Lightening your load will give you the feeling of a fresh start and help you stay organized as you settle in. Plus, you’ll save money — whether you use movers or transport yourself in a rented truck. 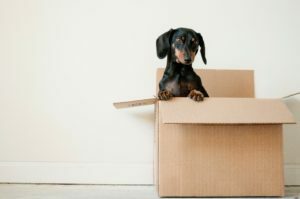 If you moved specifically for a job, you might be able to deduct relocation costs come April and get some of that money back. The criteria for taking the deduction? Distance and time. First, let’s tackle the IRS’s distance test since it’s the one that confuses just about everyone. According to the IRS, your new job must be “at least 50 miles farther from your old home than your old job location was from your old home.” Confused? Yeah, we can’t blame you. But think of it this way: If you had taken the new job but decided to stay in your old house, would your commute have increased by at least fifty miles? Yes? You probably qualify for the deduction! The other criteria — the time test — is much simpler: You have to work 39 full time weeks within the first 12 months. That shakes out to about nine months. As long as you start a new job and work full time for nine months out of the first year after you arrive, you can probably take the deduction. Of course, to make sure, it’s best to check with an actual accountant. A good accountant will not only save you money, but they’ll also provide audit protection. An affordable move is never completely out of reach. Employing just a few clever hacks and taking just a little extra care when planning your next relocation could save you a ton of money. What clever money-saving moving tricks have you discovered? Join the conversation on Twitter and Facebook! And if you’re looking for a new house, give us a holler! We have branches all over the country. Next Post: What’s the Best Time to Apply for a Mortgage?